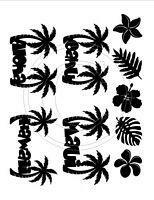 Our Island Life B stamp set includes 9 separate stamps, ranging in size from 1 in. to 2.25 in. Retro Plumeria, Lauae, hibiscus, Monstera, Plumeria, Oahu, Maui, Aloha, Hawaii.